Sticky rice is a common food made from sticky glutinous rice steamed or cooked – a rustic dish which is very prevalent in many Asian countries. As a Vietnamese people, might be you also like eating sticky rice or used to eat this dish at least once in your life. Vietnam is an agricultural country with the major crop is water rice. There are many varieties of rice, and sticky glutinous rice is a speciality of Vietnam. With glutinous rice, people can make a lot of different delicacies. Among them, sticky rice (or “xoi” in Vietnamese) is an indispensable dish of Vietnamese people. 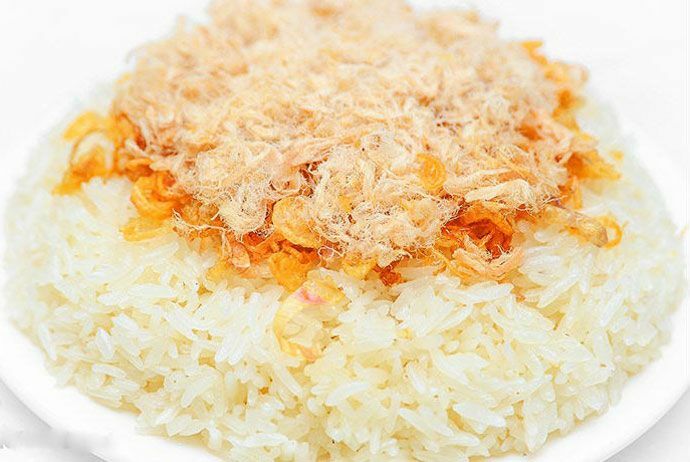 In the full moon days, Tet holidays, weddings, death anniversaries, sticky rice is a “must-have”dish for a perfect feast flatter. The main material is commonly all kinds of sticky rice, and sometimes it can be made from some kinds of fragrant rice which are soft and limber. Excepting normal white sticky rice made from just glutinous rice and a little salt, the majority of sticky rice is combined with other coloring and flavoring additives like magenta plant, pineapple leaves, gacfruit, gardenia jasminoides powder… Particularly, there are some ethnic groups (such as the Tay, Thai, Muong ethnic groups) who use many kinds of juice from leaves, tubers, vegetable roots to make colorful sticky rice dishes. Some other ingredients used to combine in such as green beans, black beans, nuts, meat, fish, corn, mango, durian, etc. can create many types of sticky rice with unique “nuances” and tastes. 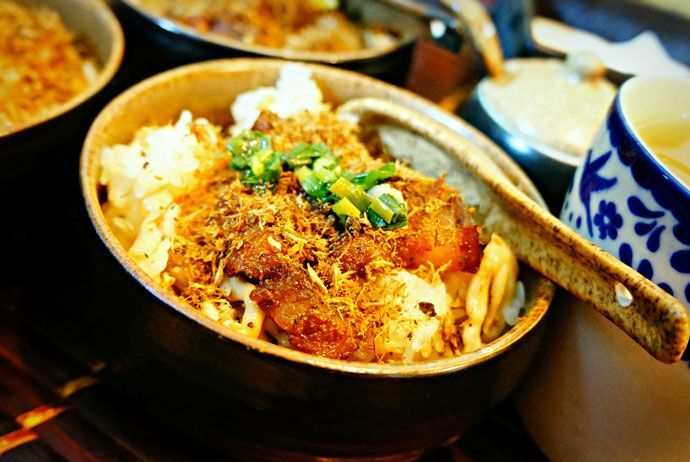 Some ingredients such as shrimp, pate, salami, roasted pork, Char siu, bacon, eggs, meat pies, rolls, and Chinese sausages are usually served with sticky rice dishes, bringing about many different flavors to diners. 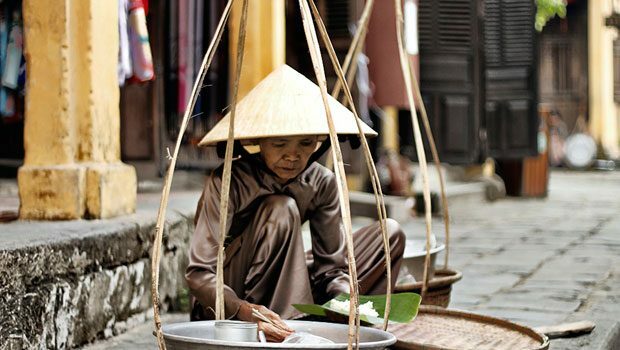 Generally, the ways to make Vietnamese sticky rice are varied depending on the types and also the customs and experiences of the housewives. However, the most popular method is soaking sticky glutinous rice in water for an sufficient time period (for hours) to allow the rice relatively to be expanded; then wash and mix the rice with a little salt and other ingredients separately, depending on the types of sticky rice. Then, put the ingredients into the autoclave (“cho” or “xung” in Vietnamese), pour boiling water into the bottom of the autoclave, put the autoclave on a pot in order to let the ingredients mostly contact with the steam but not to touch the water. After that, put the sealed autoclave and the pot on the stove and boil it over low heat until the sticky rice is well-cooked and limber. People can utilize the rice electric cooker with its steaming function or a modern dedicated steam pot to replace the traditional autoclave. 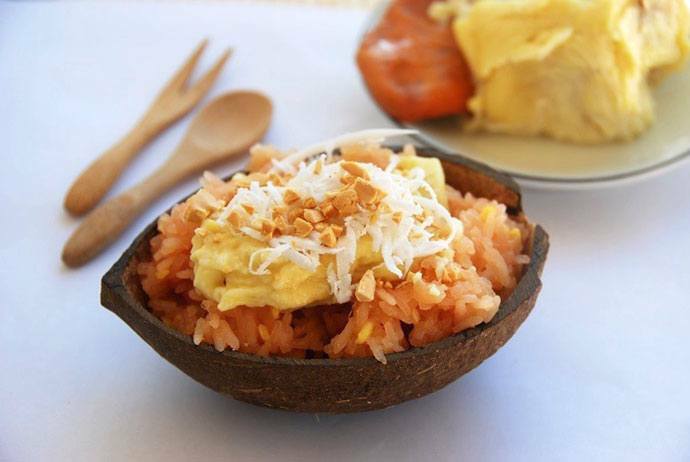 The first sticky rice dish I want to introduce in this list is Gacfruit sticky rice. 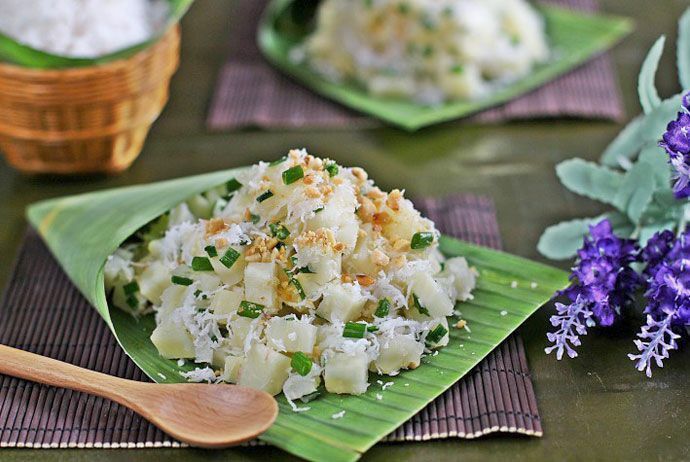 This is one of the most popular sticky rice dishes in Vietnam. 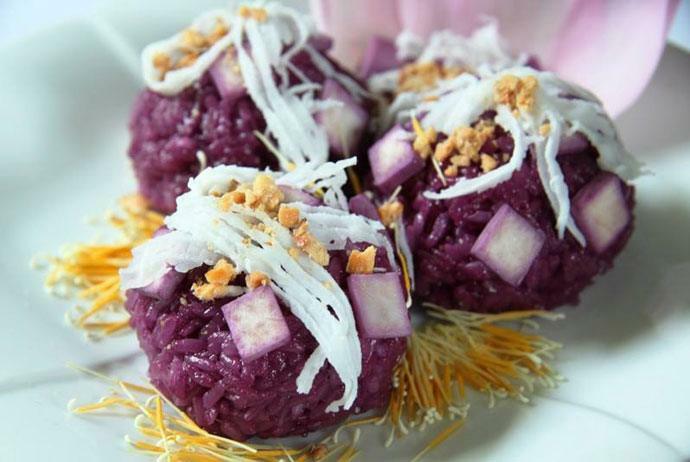 Gacfruit sticky rice is made from glutinous rice and gacfruit for creating bright red color and delicious flavor for this special and meaningful Vietnamese traditional dish. People will need to pick up the ripe Gacfruit, divided it into 2 parts and take the flesh of the fruit which covers surroundingly the red particles out, puree it with a little white wine. Then, put the softened and pureed Gacfruit flesh (including seeds) in a bowl and mix it with soaked glutinous rice. 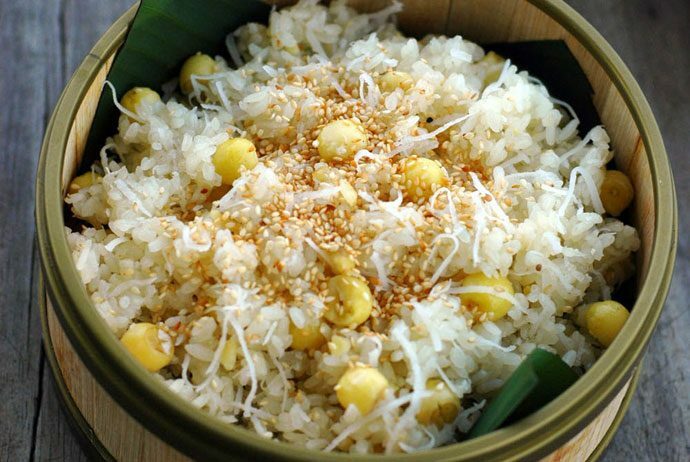 After steaming the Gacfruit sticky rice, people should remember to add a little sugar and fat to give the dish the sweetness and fatness. 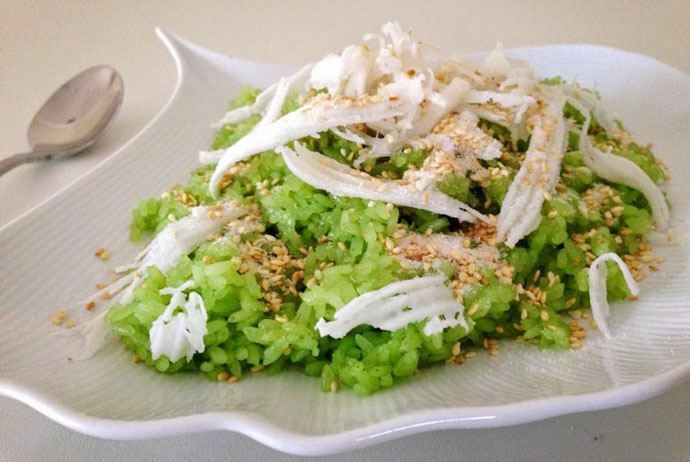 Although people do not use green bean when cooking Gacfruit sticky rice, they rarely forget to put finely-milled green bean on the top of the dish when they present Gacfruit sticky rice on the plate, right in the center as part of the stuffing. Gacfruit sticky rice is one of delicious, nutritious, and is very popular Vietnamese sticky rice dishes as an important worshiped dish in holidays, Tet, death anniversaries, or it can be accompanied by a suckling pig on a platter for the engagement ceremony. Peanut sticky rice is also called “Xoi Lac” in Vietnamese – one of the most popular rustic sticky rice dishes in Vietnam. To make this dish, peanuts will be boiled until they become soft, then mixed with soaked glutinous rice and steamed as normal. 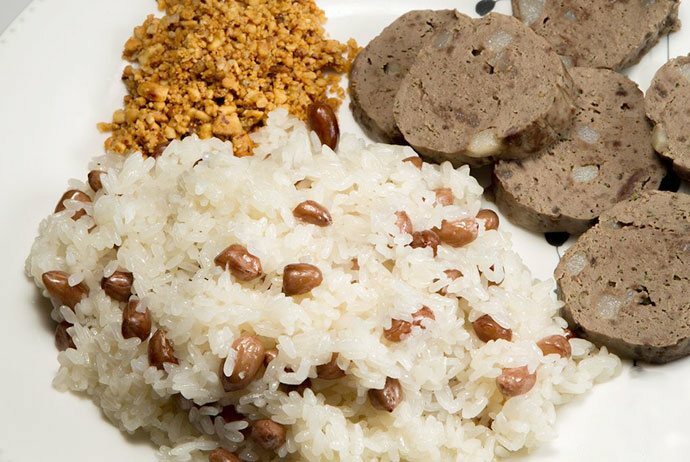 According to Thach Lam – a famous writer – in his “Qua Hanoi” culinary memoir, peanut sticky rice is served as a snack. There are 2 variations of dish: almond sticky rice and cashew sticky rice. To make green bean sticky rice, people will need to chafe green beans, soak them in water for more expanded, peel the shells (or let them stay), mix with glutinous rice, and steam the ingredients in an autoclave. This is a very popular type of sticky rice dishes, and there are many similar kinds of sticky rice dishes are processed with beans, such as black beans sticky rice, Indian bean sticky rice, soybeans sticky rice, etc. A special feature of this type of sticky rice is that the sticky rice particles are separated away yet they are still very limber. Almost similar to Xoi Xeo which has the glutinous mixed with cooked, milled green bean, but to make Xoi Vo, people need to steam glutinous rice with pineapple leaves for special aroma (maybe you can use a little Gardenia jasminoides powder or turmeric for more eye-catching color). Cooked glutinous rice will be taken out and put on a flatter and mix with a half of cooked pureed green bean in order to let the green bean cover the glutinous rice and become disjointed. Then, put the ingredients into the autoclave once again and steamed until the sticky rice becomes really limber (you can use a little coconut milk to make the dish more delicious and fragrant. Finally, take the sticky rice out and mix with the rest of the cooked, milled green bean to make the glutinous rice particles disjointed. Xoi Vo can be made with lotus seeds to get a special, delicious dish, being served as one of the important and featured dishes on the feasts in holidays, Tet, or weddings. Huangpu sticky rice is originated from China, but it is widely enjoyed and variated in Vietnam so that it gradually becomes a popular sticky rice dish of Vietnamese people. 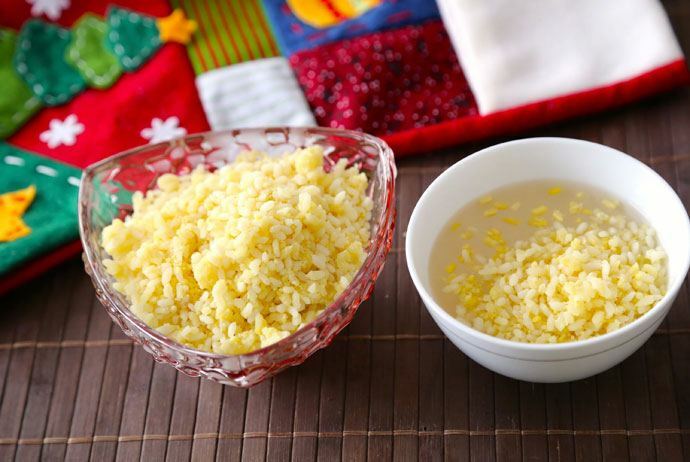 Huangpu sticky rice is yellow, fragrant, and limber. They are usually presented on feasts or parties, such as wedding parties in Vietnam. It is a delicious and attractive dish, making people never forget its taste if they ate this dish even just once. 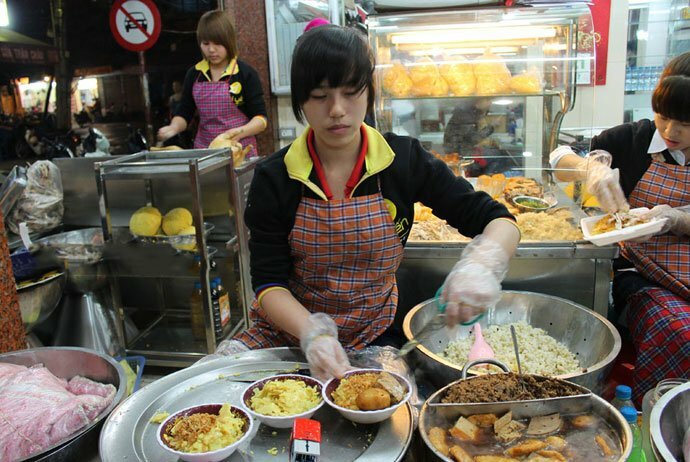 To make Huangpu sticky rice, people will need to use five-spice powder, almonds, fried onions, and cooking oil (better if using the oil from lard). Huangpu sticky rice has beautiful yellow color and pretty special taste. 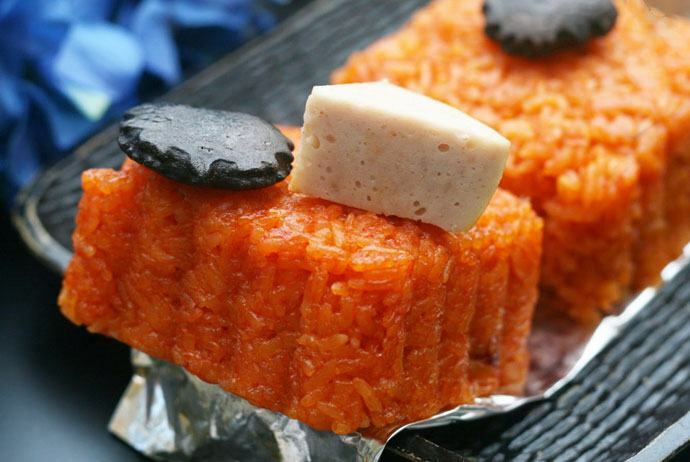 Five-color sticky rice is also known as “Xoi Ngu Sac” in Vietnamese – the prevailed sticky rice dish of some ethnic minorities (Muong, Tay, Thai ethnic groups) etc. Five colors of the dish symbolize five elements of the planet: yellow is the color of the territory, green is the color of the wood, red is the color of fire, white is the color of metal, black is the color of the water. 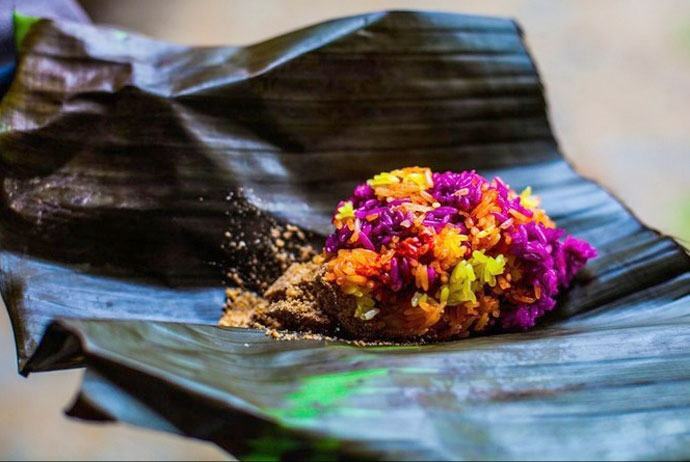 Five-color sticky rice is cooked in the combination with different types of decoctions from green, red, yellow leaves for coloring the dish. 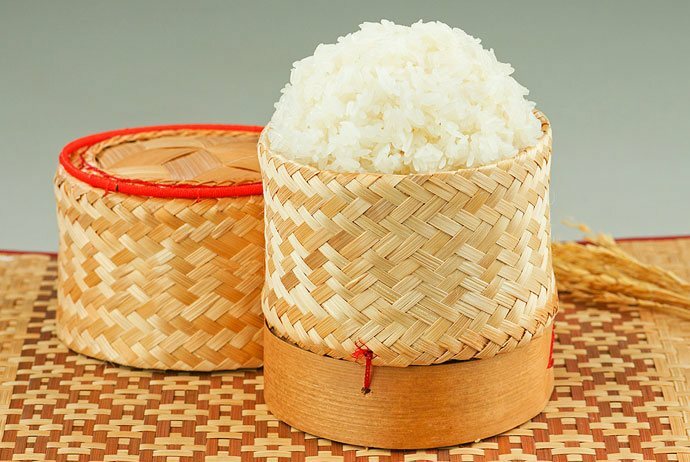 In the past, paddy sticky rice was considered as a variation of basic sticky glutinous rice. People will not use glutinous rice but they will use corn instead soaked in lime water, peeled and boiled with fried onion and cooking oil. 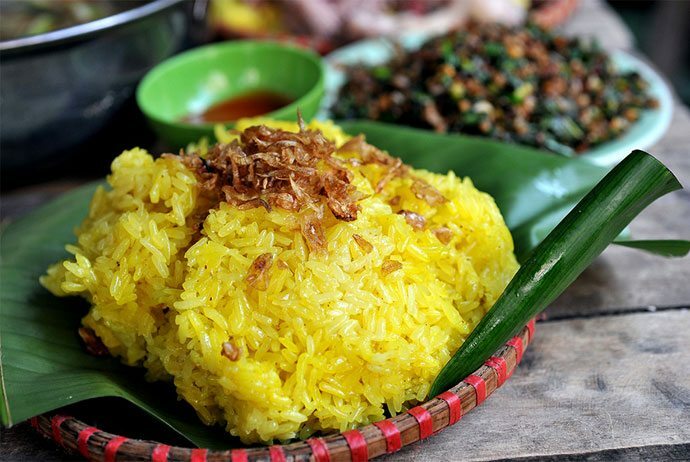 However, in nowadays, paddy sticky rice is usually made from steamed sticky glutinous rice mixed with corn, so it is also called “corn sticky rice”. This is one of special, delicious rustic sticky rice dishes, rarely used as a worshiped dish, but there are still some locals in Ha Tay where people use paddy sticky rice to worship ancestors in the new rice festival. 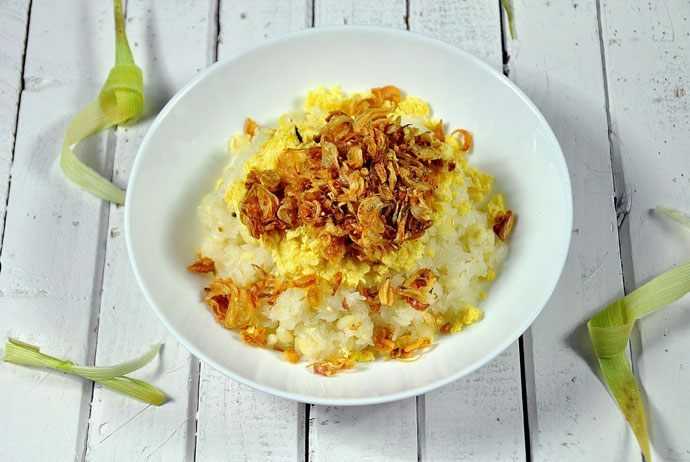 From the main ingredients which are very easy to find in any market or food store – the cassavas from poor rural areas, Vietnamese women can prepare a frugal, fragrant dish – the cassava sticky rice. It is a rustic dish from the countryside, made from sticky glutinous rice mixed with cassava strands or small cassava pieces. It will be steamed and mixed with a little fried onion and cooking oil (better with oil from lard). This is a popular dish in Southern Vietnam. To make durian sticky rice, people will need to take the flesh of the durian and mix it with sticky glutinous before steaming the mixture with a little coconut milk. Another way to make durian sticky rice is that people will need to steam the sticky glutinous rice and then mix it with durian. Pandan (pineapple leaves) will be cut into smaller pieces and washed. Then, smash them and juice them to take the pandan juice; then mix the juice with sticky glutinous rice before steaming the mixture. The result we will get is a beautiful green sticky rice pot with attractive fragrance. The way to make magenta plant sticky rice is similar to Xoi Xeo with milled cooked green bean, but it will be mixed with the decoction of the magenta plant for the purple red color. Sesame coconut sticky rice is made from sesame, coconut, and sugar, mixed with sticky glutinous rice and steamed. This is a very delicious sticky rice dish but sometimes it can make people feel a little bit greasy due to the taste and the aroma of coconut oil, sesame oil, sugar, and cooking oil (from lard). Gnaphalium affine sticky rice (also called Khuc cake or “xoi khuc” in Vietnamese) is made from crushed gnaphalium affine mixed with sticky glutinous rice powder, rolled with cooked milled green bean and diced fat meat, then rolled over sticky glutinous rice and put into the autoclave. 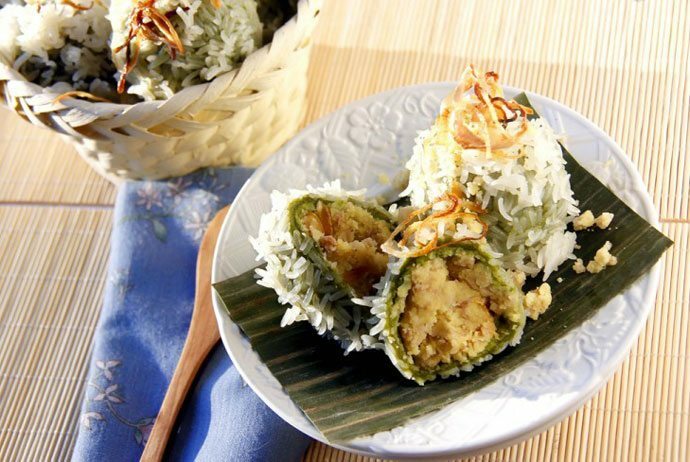 Each Khuc cake is covered by a layer of sticky rice, stuffed with green bean, fat meat, and fried onion which tastes very delicious. This is actually one of the best sticky rice dishes in Vietnam. Basic sticky rice is made only from glutinous rice and salt, without any other ingredient or additive (sometimes it is just combined with a little food coloring). Sticky rice is usually very popular as a delicious traditional dish in the combination with other materials from animals, such as shredded salted meat, eggs, sausage, pate, sausage, Chinese sausage, Chinese braised pork…creating many kinds of sticky rice dishes, including egg sticky rice, meat pie sticky rice, Chinese sausage sticky rice, braised pork sticky rice, pate sticky rice, and shredded salted meat. Steamed sticky rice is made from easy-to-find materials, including glutinous rice, cooked green bean, cooking oil, and fried onions. Green beans are selected must be fresh without floaters. People will need to soak the green beans to soften them, peel them, and then cooked them well until they become friable. Then, take the bean out and crush them out or even mill them in a mortar to get smooth green bean powder and then tightly hold them to get a big green bean roll before the green bean powder becomes cool. Sticky glutinous rice will need to be soaked for several hours, mixed with a little salt and a little turmeric or gardenia jasminoides powder for beautiful yellow color, and then steam the mixture. Peel and slice purple onions before exposing them to the sun until they become a little bit wilted, and then, fry them in a pan with a lot of cooking oil. When serving the steamed sticky rice, people will use a knife to slice the green bean roll, present the slice on top of the sticky rice bowl, and sprinkle it with fried onion and a little cooking oil (oil from lard). This dish is considered one of the most delicious sticky rice dishes which are not difficult to cook and the materials are also very easy to find. Chicken sticky rice is made from sticky glutinous rice, coconut milk, and pineapple leaves (or pandon). 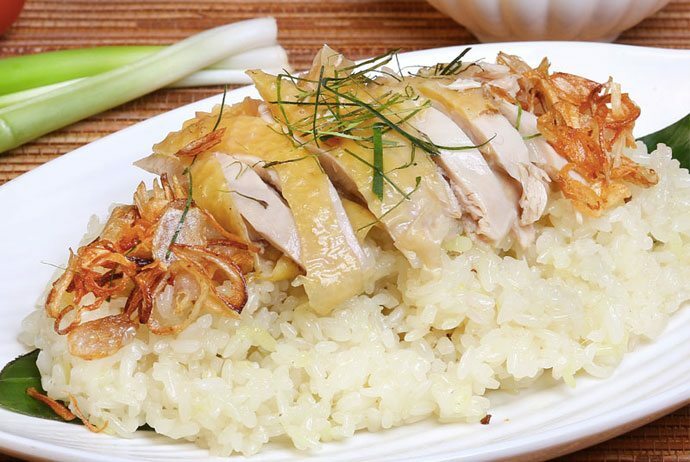 The steamed sticky glutinous rice will be served with teared boiled chicken or roasted chicken, with sliced Chinese sausage served as a side dish. 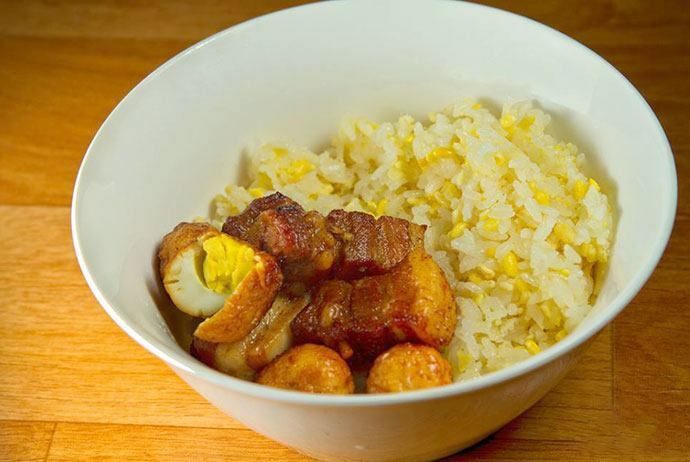 This dish is one of the most popular sticky rice dishes in the Northern Vietnam. 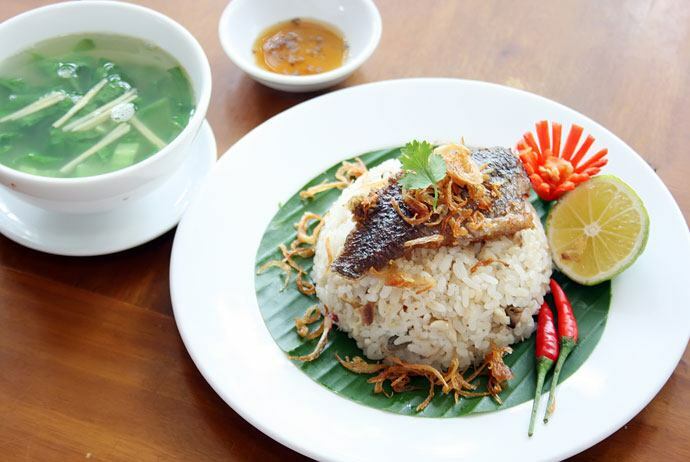 To make fish sticky rice, Vietnamese people steam tilapia or stream fish, take the fish flesh, fry until the flesh is fragrant, and then mix it well with sticky rice. This is the last one on the sticky rice dishes list I introduce to my readers today – the mango sticky rice (or “Xoi Xoai” in Vietnamese). This is a very simple sticky rice dish. 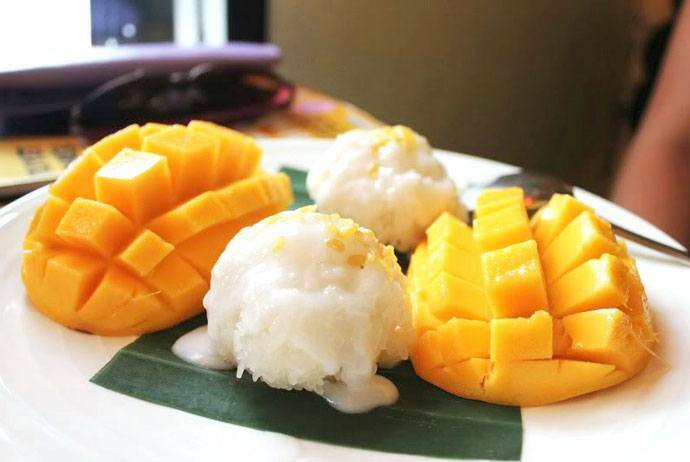 People just need to cook basic sticky rice, baste sugar water and coconut milk, and served the dish with sliced ripe mango. Is Vietnamese Food Healthy? 15+ Best Healthy Foods In Vietnam!